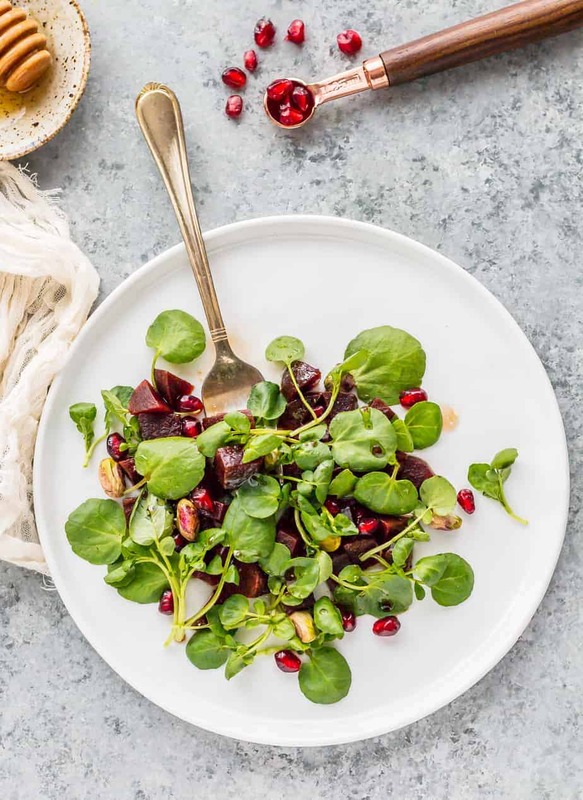 This Watercress Beet Salad Recipe is packed with amazing health benefits. It tastes delicious, is refreshing and is very easy to make. The perfect vibrant colors of green and red make it a fun dish to add to your Christmas dinner menu (and who says you can only do Christmas cookies in green and red, ha). 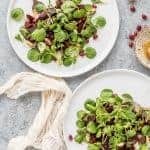 I like the mixed texture of the two vegetables, beets are unlike any other in their consistency, and the slight crunch of the watercress makes for a nice bite. Beets are excellent source of folate while watercress are providing nutrition, boosting immunity, cancer preventive and thyroid support. Beets are also an excellent source of both folate and manganese. 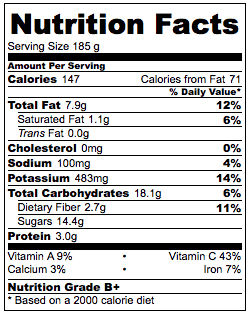 As for watercress, it has been rated the healthiest vegetable on many respected websites and journals. Some stay away from watercress due to its strong taste, but with the right accompanying vegetables and a tiny bit of something like vinegar for dressing you’ll be enjoying it just like any other leafy green. Pomegranate is another component of the recipe that adds a lot of flavor, and a different popping texture too. I personally love adding fruit in my salads, and similar to beats and watercress it is among the healthiest out there. I made this with and without the pistachios as my friend has a nut allergy… both tasted great. This may be one of the healthiest salads I’ve posted. It’s unique but really tasty even for those that aren’t gung-ho on eating veggies. I put it to the “kid test” and had two clean plates and two smiling faces afterwards, success! Healthy, delicious and easy beet salad recipe. This recipe is packed with nutrients. This is actually something that I would try and recreate and feature in our blog. Nice idea to make a salad with watercress and beetroot. What a beautiful salad! I love the colors – so vibrant and fresh. The homemade balsamic dressing sounds good too. I need to make this lovely salad this weekend. Oh my goodness this is such a gorgeously colourful salad – just the sort of thing you need within the dullness of winter. Oh my gosh I really want to try this! I love all the colors in it, perfect for Christmas and healthy. Watercrest and beets make for a great looking salad plus the taste is wonderful. Don’t over look beets. My daughter really like beets. This looks like a fresh salad that she would really enjoy! I think I would like it too. This looks like such a delicious salad. I have never had a watercress and beet salad before. This salad would make eating healthy a breeze! Beets are one of my favorite vegetables, I just wish they weren’t so messy. 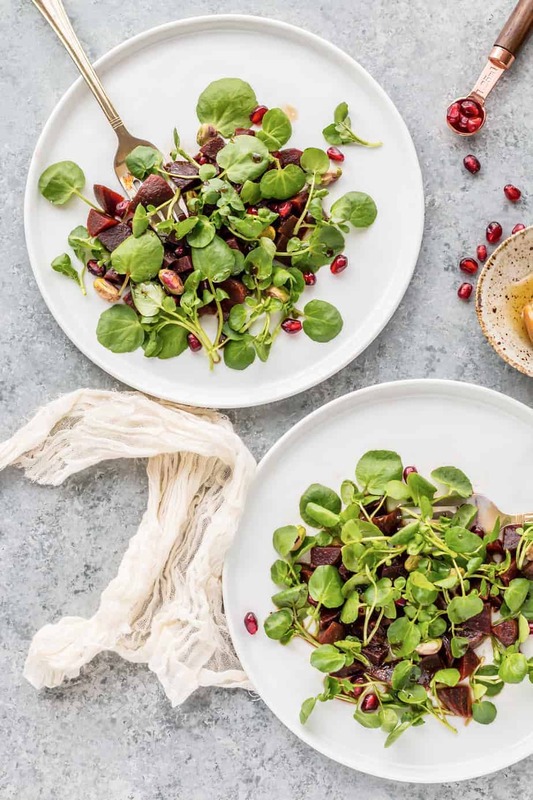 This watercress beet salad recipe sounds awesome. I would to make this salad because I never made one like this before and I know my family would love it. Thanks for sharing the recipe. This looks delicious! I don’t eat beets very often, but this salad makes me want to eat them more often. Can’t wait to try it! Oh, that sounds so good! I love beets, and a salad is always a good way to get in extra nutrients. That looks really pretty and delicious and also healthy. Can’t wait to make this. It looks delicious and sound great for my waistline. I’ve never had watercress. Hi Mimi, yes this salad can be filling enough and really has no bad ingredients. Watercress is newer to my diet as far as veggies go, but it’s quite amazing. Here’s an article on time.com showing nutrition by density of each vegetable and watercress is #1: http://time.com/2827608/41-superfoods-ranked-by-how-healthy-they-are/ The consistency and shape are great but the actual taste is a bit strong, so I found that the light vinaigrette added to this salad really helps. I don’t usually like beets but this recipe looks and sounds delicious! I need to try it! My husband loves beets…me not so much. This sounds delicious and healthy too. Great recipe! I love a good beet salad! Looks delicious!